For a few years now a team of employees of the Institute of Computer Science of the Lublin University of Technology has been cooperating with universities and museums in Uzbekistan. The main area of cooperation is the digitisation of cultural heritage objects – remnants of the trade “Silk Road” connecting China and Europe for centuries. The cooperation is coordinated by Prof. Jerzy Montusiewicz, and Dr. Marek Miłosz. The team also includes doctors Jacek Kęsik, Marcin Barszcz and Krzysztof Dziedzic. Milestones of cooperation have so far been two scientific and research expeditions to Central Asia organised in 2017-2018 (https://cs.pollub.pl/druga-wyprawa-naukowa-instytutu-informatyki-do-azji-centralnej/?lang=en) and two scientific conferences (https://cs.pollub.pl/dziedzictwo-jedwabnego-szlaku-konferencja-w-uzbekistanie/?lang=en, https://cs.pollub.pl/english-it-in-cultural-heritage-management-it-chm/?lang=en). The Lublin University of Technology has signed a cooperation agreement with the Registan Museum in Samarkand. The museum consists of three monumental buildings of the madrasas (15-17th centuries), i.e. schools consisting of lecture halls, a mosque and a specific dormitory. The Registan Museum includes the famous Sher-Dor madrasa with a huge mosaic on the portal, showing tigers, snow-white gazelles and the sun with a human face. This is the undisputed showcase of the city of Samarkand. 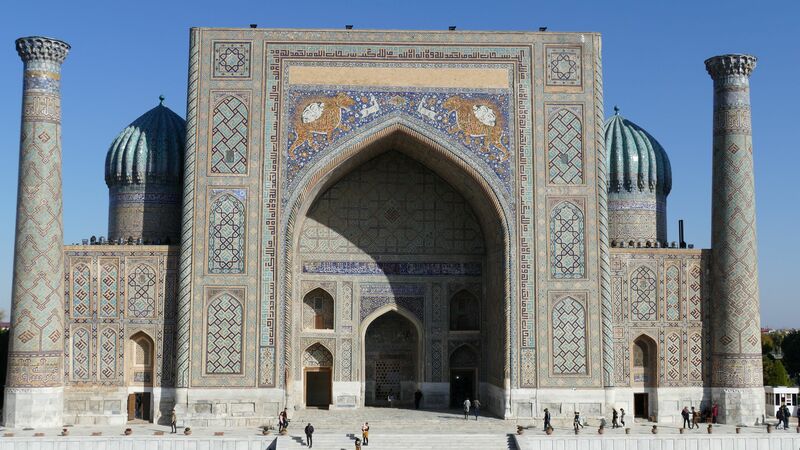 The team from the Institute of Computer Science has already done a 3D scan of the madrasa portal and its digital photos. This allowed to obtain a digital image of the portal with high accuracy, sufficient to support conservation work, which consists in replacing parts of the portal tiles. Samples of the work of the team from the Institute of Computer Science checked on the spot (i.e. directly on the portal by rock climbers abseiling from the top) confirmed the validity of the adopted method. According to the Uzbek newspaper Narodnoye Slovo (http://xs.uz/ru/post/na-registane-spasayut-tigrov), “this technologically advanced work on historical objects of Uzbekistan is taking place for the first time …”. Work will continue.